All Saints Church01553 771779work ChurchWelcome to All Saints. 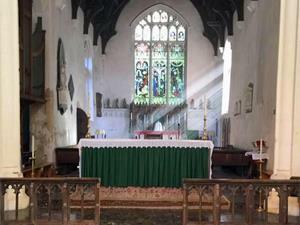 All Saints is a beautiful church and is the oldest church in Kings Lynn but is not well known, it takes some finding. Those who seek it out are richly rewarded, that's why we call it 'the hidden pearl'. To have faith in God is a priceless gift.We hope that you will come and find Him here as we welcome you to our services and events, or just come and visit and enjoy a moment of peace. From May-September the church is open on Saturdays from 10am-5pm, around services and at other times by appointment with the Rector. All Saints is the oldest Christian foundation in the town, and is the original parish church of Lynn. It was formerly known as All Hallows, the old English form of 'All Saints'. It is referred to in a document concerning the building of St Margaret’s, dated 1101, and is described as the church of William, son of Stanquin, lying to the south of Sewaldsfled, the present Millfleet. The Saxon church, of which nothing now survives, was rebuilt by Ralph de Toeni in c.1095, and was under the patronage of the Augustinian Priory of West Acre until 1534. Traces of this building can be found in the south wall of the chancel near the anchorhold. See the Weekly News Update, Music events and Calendar sections of our website for details of forthcoming services and events.